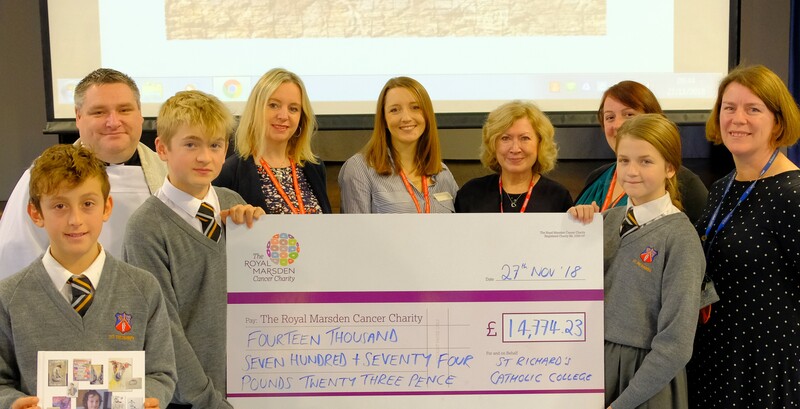 We were delighted to welcome Lydia Clark from The Royal Marsden Cancer Charity to attend our year 10 service on Tuesday 27th November. Lydia presented pupils Louise Kavanagh and Joseph Zillwood with a cheque for an incredible £14,774.23. 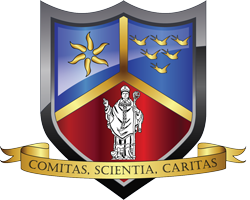 £12,500 was raised by Sophie’s Secret Postcard Auction with the rest of the money raised by pupils through a variety of different fundraising events from cake bakes to sponsored cycles in memory of former pupil, Sophie Maria Taylor, 6th August 2004 to 5th April 2017. We were also pleased to have visitors who supported Sophie’s Postcard. Gail Mackay from Custard Design, who printed the blank postcards and envelopes; Maria Hudd from the Observer and freelance journalist Jean Clark..
Sophie’s Secret Postcard Auction was a charity postcard auction which ran during June 2018. Celebrities, renowned artists, pupils, parents, staff and accomplished local artists were amongst those participating in Sophie’s Secret Postcard Auction and over 570 original postcards were auctioned on eBay with work by amazing artists including Sir Quentin Blake.